Featuring innovative "Swipe To Shine" touch technology, the INOVA Microlight STS is compact, convenient, and impressively powerful. Its durable, water-and-shock-resistant casing is designed to fit comfortably in your hand. It's our brightest INOVA Microlight, with an impressive 16 lumens. The white LED is activated nearly instantly with a quick right-to-left swipe of the thumb, eliminating the need to fumble with a switch. High, variable dimming, low, and flash modes allow you to use the light for everything from reading maps to finding keyholes to sending alert signals. The included versatile S-Biner Stainless Steel Double Gated Carabiner can be clipped to key chains, belt loops, zipper pulls, purse or backpack straps to keep your Microlight STS conveniently where you need it, when you need it. Powered by 2 replaceable 2032 lithium batteries (included). The QuikStand was designed to eliminate the use of randomly assorted books, coffee mugs, and cereal boxes to prop up our valuable smart phones and tablets, and also do away with the unreliable support they provided. Made with sleek brushed aluminum and sturdy, yet flexible polypropylene, the QuikStand can be adjusted to different angles, and holds your device securely in either portrait or landscape orientation. In its resting state, it's about the size of a credit card and easily fits in your wallet. To use, simply unsnap the aluminum back support out of the polypropylene base, then, raise the adjustable aluminum support bar to the desired position and slide your device between it and the front flap - it fits smart phones and 7" tablets with or without cases. The easy portability of the QuikStand makes it great for travel, and perfect for reading recipes, video chatting, browsing the internet, or catching up with the news - wherever you are. Clip Case Cargo Sideways Large Mossy Oak Made of durable ballistic nylon to protect from impacts, and accented with weather-resistant, rugged hypalon material, this case is designed to keep your phone safe and at-hand on your belt, in a fixed horizontal position. Three universal sizes accommodate most phone sizes with or without form fit cases. Your phone stays secure with a durable hook and loop closure, and an interior pocket provides a handy place to store ID, credit cards, or cash. Perfect for rugged work or play environments of nearly every kind. 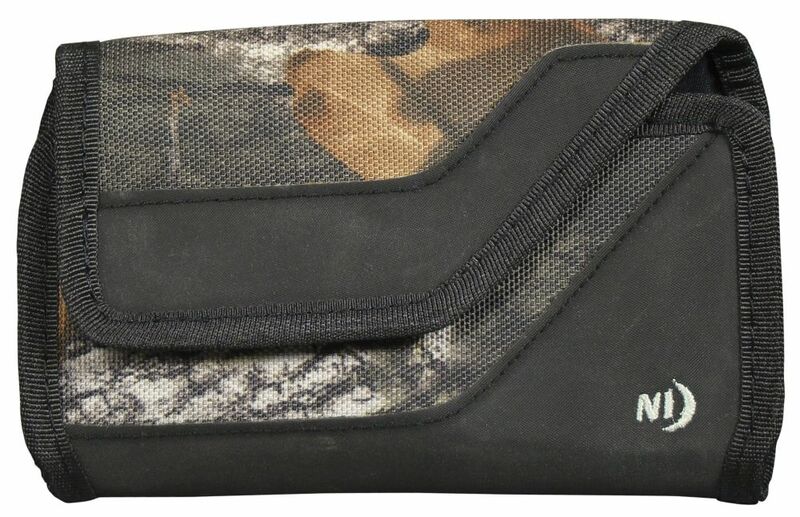 Clip Case Cargo Sideways Large Mossy Oak is rated 5.0 out of 5 by 3. Rated 5 out of 5 by Judd from The best heavy duty phone holder made, in my humble... The best heavy duty phone holder made, in my humble opinion. Rated 5 out of 5 by Leland from I like it. I think it will work to hold my phone. It seem to be made tough. Time will tell.